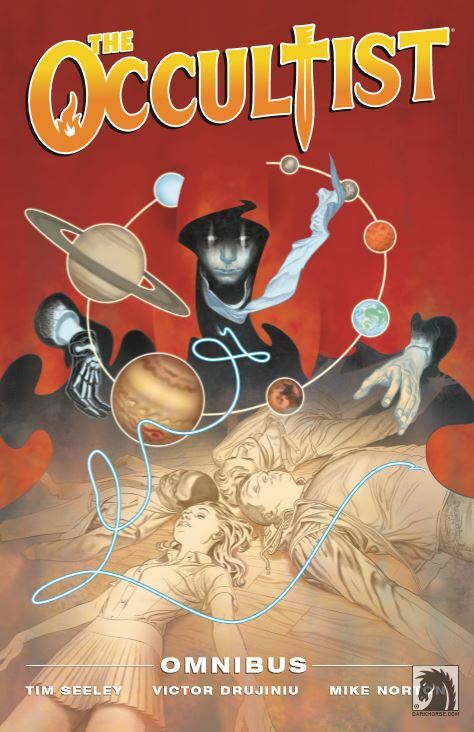 Originally published in 2012, Dark Horse is resurrecting a cult classic with the release of The Occultist Omnibus. Your typical boy-gains-supernatural-powers story, The Occultist follows the monster-fueled adventures of college kid Robert Bailey, who after coming into contact with a mysterious old book, is given the mystical powers of The Occultist. This, we discover, is quite a big deal both in this world and beyond, and quite a few baddies either want to kill Robert to get the power for themselves or just do away with him for funsies. Reminiscent of Dr Strange, this series was created by Dark Horse founder Mike Richardson (Star Wars, Predator, Aliens, Godzilla) and Tim Seeley (Batman, Nightwing, Suicide Squad). It’s easy to tell the dynamic duo had fun with this one. The series is a veritable riot of techno-magic, blood-soaked battles, and bad behaviour. Having a preexisting penchant for anything occult related (I have more Hellboy graphic novels than furniture by now), I loved the idea of blending magic and technology, and the rogue’s gallery of magical assassins were awesome. I was reminded of titles like Hellblazer and Justice League Dark, where black magic merges effortlessly with the real world and badass villains burst from every page. Volume One (drawn by Victor Drujiniu) plays out as the inevitable origin story, where we meet Robert at the moment his life is about to change. His girlfriend has left him, his Bible-thumping mother constantly hounds him, and he hasn’t been paid for weeks. Then he is chosen by a mysterious book to wield the powers of the occult. But poor Robert doesn’t have much time to practice before he is faced with a tsunami of enemies. His ally, Detective Melendez, feels more like a sidekick than an equal partner, but while she doesn’t play as much of an active role as I would have liked, there is no shortage of female characters, including a modern-day Pandora and her box of evil. Volume Two (drawn by Mike Norton) is a little meatier, with Robert now in full control of his abilities. We see the return of his nemesis, the phone-reading techno-shaman Aidan Beck, and all new magical encounters—think astral projecting teenagers and vampires—that are enough to make any spooky kid happy. We also learn more about the techno-shamans (drawn with formidable skill by Norton). The art in both volumes is great and full of gory detail, with darker lines and shadow used to great effect by Drujiniu, lending a fantastic dark quality to the story. Norton does wonders with the realm of the dead, which oozes evil. The omnibus also features a kickass cover by Steve Morris (Buffy the Vampire Slayer) making it quite special in its own right, since Morris’s Whedonesque work is some of the best out there. The Occultist is an entertaining title full of awesome supernatural bad guys and gorgeously grim artwork. I’d say it’s a must-have for lovers of darker titles like Hellboy, BPRD, and Justice League Dark.